HERTFORDSHIRE, United Kingdom —“Strictly Come Dancing”, one of the BBC's flagship family entertainment programs, has become the latest to benefit from the comprehensive broadcast production services at the new home of BBC Studios And Post Production - Elstree Film Studios.Facilities include a new audio installation featuring a MADI / fibre-optic infrastructure and flexible routing and mixing framework, with HARMAN’s Studer Vista and OnAir technology at its core. Only the second show to use the new facility, “Strictly Come Dancing” made full use of the George Lucas 1 sound gallery's 70-fader Studer Vista 8 console for primary mixing duties. 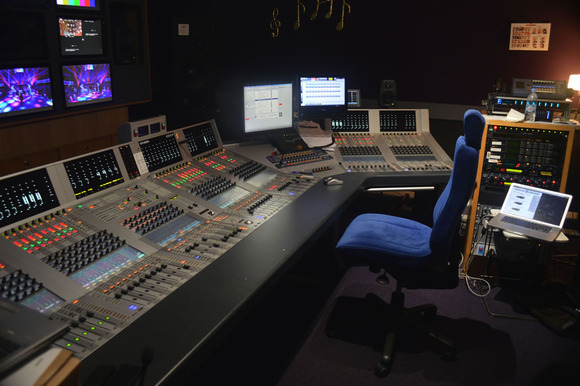 In addition, a StuderOnAir 3000 console was used for grams and as a system routing hub—with control from BBC Studios and Post Production's Broadcast Network Control System. A Studer Vista 1 console took care of the surround mix and down-mix check for the BBC 1 HD channel feed. Sound Supervisor Andy Tapley specified the audio system, which is replicated across the other BBC Studios and Post Production stages/studios at Elstree, in order to maintain consistency and cope with some of the UK's most complex TV productions. Strictly Come Dancing is especially demanding. "By half past six on a Saturday night we have to be ready to go, whatever," comments Tapley. "...And that involves the live music as well, which is one of the things that sets Strictly apart from other shows. "The music is incredibly diverse—it can range from Carmen to classical pieces to heavy rock for the next one.We rely on instant snapshot recall...You can't rely on the woodwind section just being one type of instrument so you might have to dial in another 15dBs on a mic, plus high pass filtering, just to get a flute through; and it has to happen just like that." Studer D21 I/O systems were used to move approximately 150 feeds from the show floor, including the 20-piece band and 60 channels of RF from contestants, presenters, judging panel, and IEM systems. More were employed for the Vision Apparatus Room (VAR) I/O, the grams/OnAir 3000 system, and the reverb/outboard bay. The Vista 8 was the main show console, configured as a dual operator board for Andy Tapley and Sound Mixer Tony Revell. "The dividing line between operators is constantly re-definable," comments Tapley. "It doesn't have to be set before hand... If I need a hand I can drag and drop channels anywhere, as we go." On the evening, Tapley takes responsibility for the band mix, while Revel manages all of the microphone feeds, including an extensive audience mic set up. The Vista's unique cascading control groups make the surround stem provisions much simpler, while for Tapley every spare moment before the show starts is an bonus: "Because of the schedule we're grabbing every opportunity we can to refine the music mix. The second we get a break we can, at the press of a button, turn our band channels round to their second inputs and have the multitrack replay back though, refine the mix, and then save that as a snapshot." The new StuderVistaMix automatic mixing system was used for managing the judges' and contestants' microphones—especially effective in the show's mezzanine area where co-presenter Tess Daily and the contestants gather in close proximity, often contributing ad-hoc comment. Overall, the facilities and the crew at BBC Studios And Post Production, Elstree have proven themselves worthy of the biggest and most demanding broadcast productions around. The Studer Vista and OnAir systems are an important part of that story. Photo Caption 1: (Left) Andy Tapley and Tony Revell working on the Studer Vista 8.